DEARLY DEPARTED—Embracing themes of ancient rituals that celebrate the memories of deceased loved ones, artists have long created Dias de los Muertos (Day of the Dead) art for appreciative aficionados. 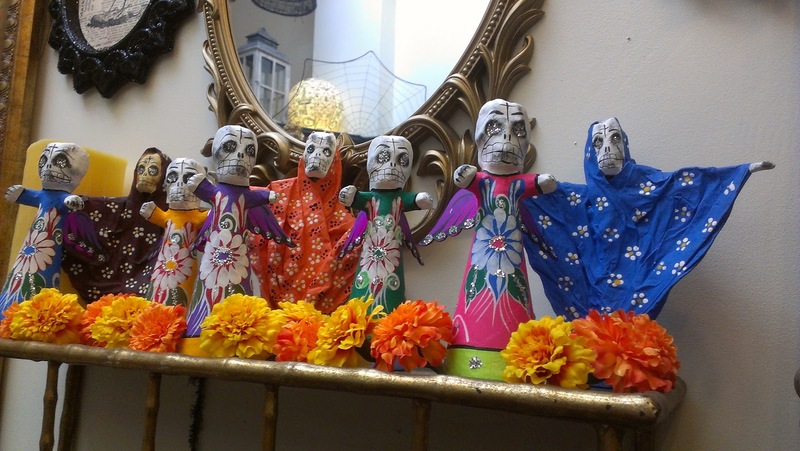 From beautifully decorated skulls to fashionable and dramatic skeleton figures, these gothic yet gorgeous works have become more mainstream with shop keepers everywhere carrying Day of the Dead decorations. 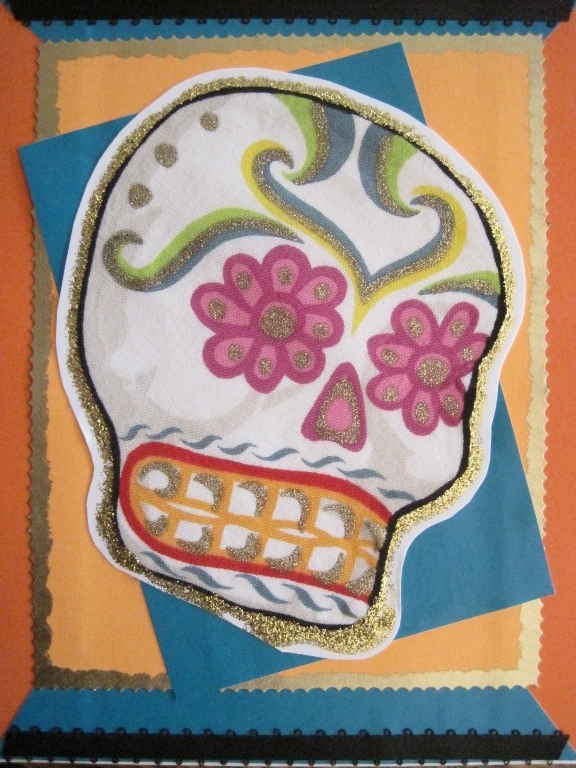 In San Diego’s Mission Hills neighborhood, Jimmy and Valerie Ferrari have turned their jointly owned “Le Bel Age Boutique” (1607 West Lewis St.) and “With Love” gift and paperie shop (1620 West Lewis) into showcases of original art celebrating the pre-Hispanic tradition. For now, West Lewis Street is Day of the Dead central thru November 3. 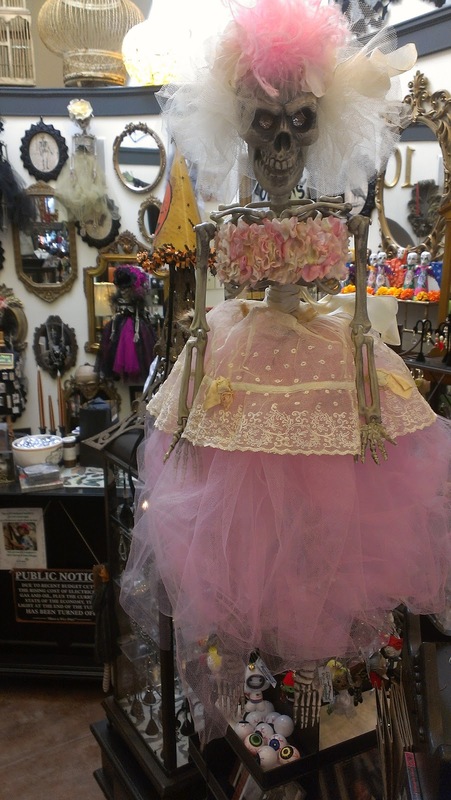 The Ferrari’s shop are especially delightful with their theatrical collection of Dia de los Muertos skeleton brides, all of which are hand-crafted by Valerie Ferrari’s mother. Ranging from classic black bridal themes to silvery princess brides with pearls, no two are alike. This uniqueness and attention to detail is reflected in the pricing of the large figurines, which begin at $200. 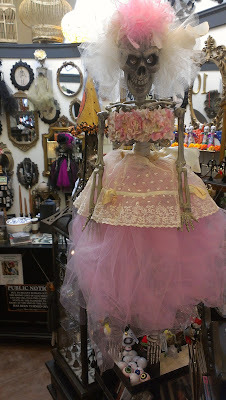 The grand dame of Dia le los Muertos shopkeepers in San Diego can still be found at Dianne Power’s Bazaar del Mundo in San Diego’s Old Town (4133 Taylor Street), where her decorations range from dancing skeletons to colorful banners and cards. --Skeleton art card from Bazaar del Mundo. 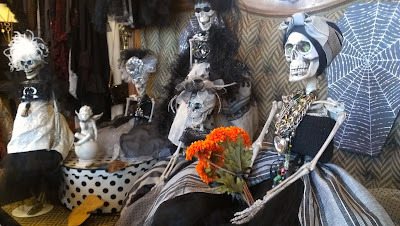 Photos by Phyllis Shess, October, 2012.